I am not a big fan of riding at night on my KTM 1190R, but if I have to, I obviously like to see as much as possible. 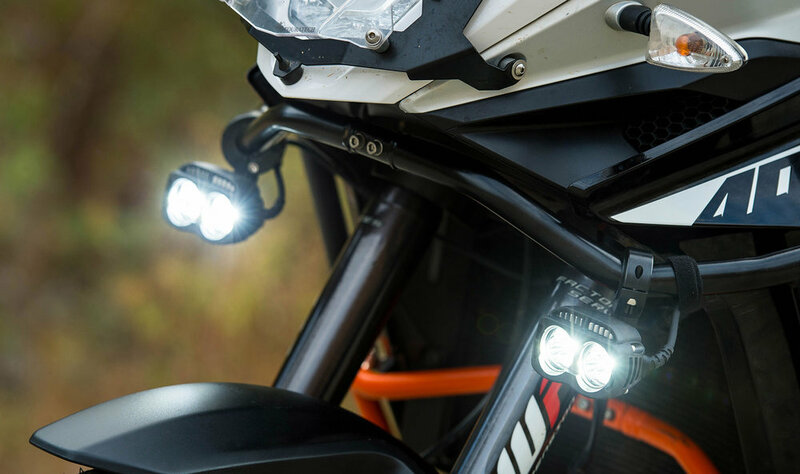 The stock lights on most adventure bikes will do a decent job of lighting the road and trail in front of you. However, as soon as you add some aftermarket illumination to your ride, there’s no going back to the stock set-up. The main thing I like about these NiteRider headlamps is the ease of installation. No need for drilling or riveting mounts onto your bike, as these two lights easily clamp on to most crash bars. I have Touratech crash bars on the 1190 and all I had to do was use a 4mm Allen key to mount the lights. Simple. The lamps are powered directly from the battery and NiteRider includes a wiring harness that has a bar-mounted remote switch. Also in the box are different sizes of plastic shims to mount to various bar sizes. While in use the remote switch has three click settings: Off, Low, and High power. The bulbs are CREE LEDs, extremely bright compared to the stock headlights, and put out 4200 lumens from each lamp for a total output of 8400 lumens. Once installed in my garage, I waited for dark to adjust the beams of the lights on the street. I liked that I could easily set the lamps up and lock them in place with the 4mm Allen. On the trail at night I widened the spread of the lamps to illuminate the trail sides a bit. There is so much light streaming from these units that night riding is not really an issue for me anymore. I have more confidence to see the trail or road, but also to be seen much better by other vehicles.